Karma Network | Alex Bojer: "I think technology definitely is an enabler these days." Alex Bojer: "I think technology definitely is an enabler these days." Working in the storied Swiss insurance space, Anivo 360 AG, a leading insurance tech player based in Switzerland, leverages insurtech algorithms to match customers with the right policies, using automated actuaries and a tariff engine to greatly cut the cost of traditional insurance underwriting. The company is also a leader in Europe’s nascent “bancassurance” model, in which Anivo’s banking clients act as intermediaries and sell Anivo’s products to their own clients. 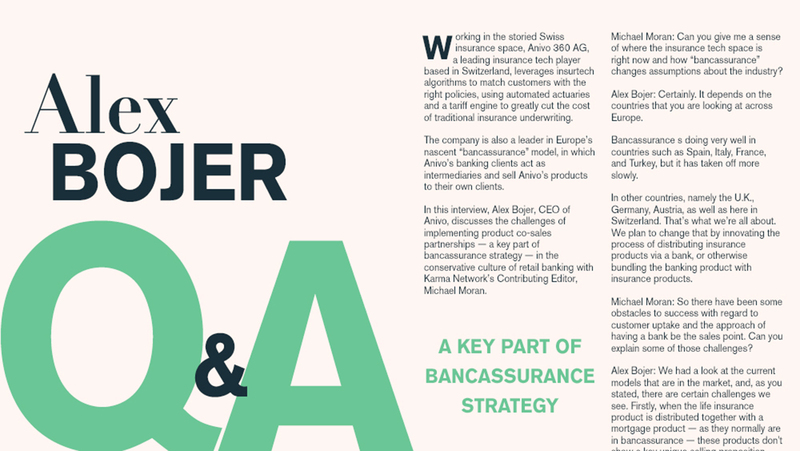 In this interview, Alex Bojer, CEO of Anivo, discusses the challenges of implementing product co-sales partnerships — a key part of bancassurance strategy — in the conservative culture of retail banking with Karma Network’s Contributing Editor, Michael Moran. Michael Moran: Can you give me a sense of where the insurance tech space is right now and how “bancassurance” changes assumptions about the industry? Alex Bojer: Certainly. It depends on the countries that you are looking at across Europe. Bancassurance is doing very well in countries such as Spain, Italy, France, and Turkey, but it has taken off more slowly. In other countries, namely the U.K., Germany, Austria, as well as here in Switzerland. That’s what we’re all about. We plan to change that by innovating the process of distributing insurance products via a bank, or otherwise bundling the banking product with insurance products. Michael Moran: So there have been some obstacles to success with regard to customer uptake and the approach of having a bank be the sales point. Can you explain some of those challenges? Bojer: We had a look at the current models that are in the market, and, as you stated, there are certain challenges we see. Firstly, when the life insurance product is distributed together with a mortgage product — as they normally are in bancassurance — these products don't show a key unique selling proposition (USP) when compared to what a customer can get from an inside agent, from an insurance broker, or from a comparison website. So we absolutely fundamentally believe that new products are necessary to be more relevant to the customer as a point of need, and which show a key USP compared to the existing products on the market. Secondly, what we have figured out is that while a banker has a very, very high level trust from their customers, they are not very good in selling insurance and advising on insurance products. So therefore we had to change the process to where the bank would essentially become the lead generator before handing off to Anivo insurance experts in our customer service center so we can do the advisory for the insurance product. The last piece is about technology. On one hand, you have banks with their core banking systems and on the other hand, you have insurance systems. Both systems are very robust, but showed some inflexibility when being put together. So we were able to leverage our technology by creating better integration between insurance and banking, which has made it far easier for the bank to understand and deploy these products. 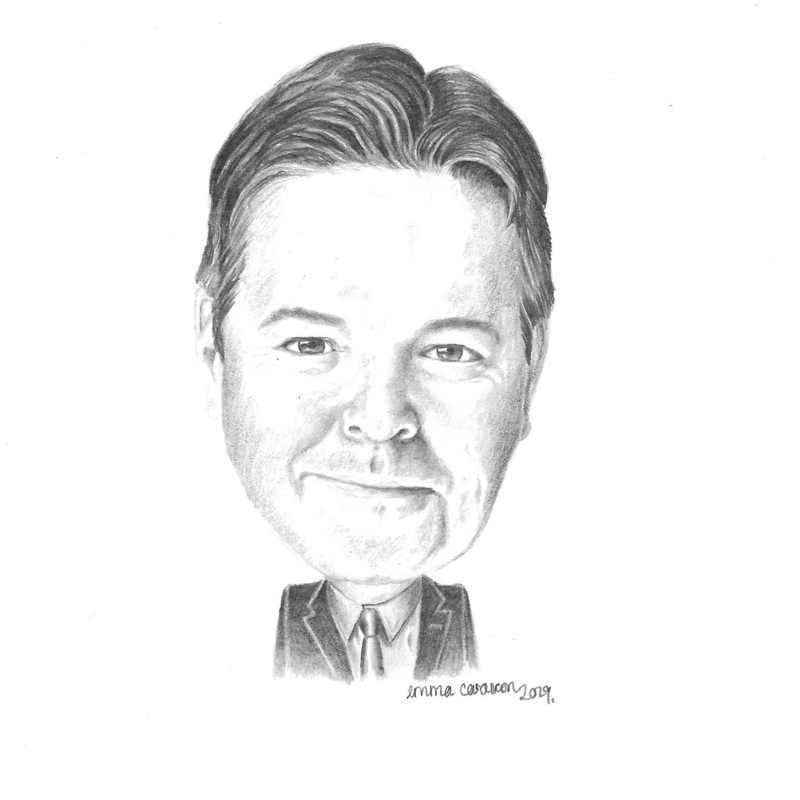 Michael Moran: Insurance is a heavily regulated industry, and so is banking. You have both the European Banking Authority (EBA) and the Swiss Financial Market Supervisory Authority (FINMA), to contend with. Can you give me a sense of the regulatory risks that exist? Have they been an additional drag on the uptake? Bojer: I’m glad you asked. We need to differentiate between regulation in the European Union (EU) versus Switzerland. And within the EU, there are specific regulators in specific countries, too. What we see in the EU is that the two-tiered regulation creates new opportunities for third parties like us to work with data that were traditionally owned by the bank. For us here in Switzerland, the main obstacle in terms of regulation was to find a way for a banker who is not a FINMA-regulated insurance agent to provide us with the lead and to inform the customer about the risks, but is still able to turn the conversation over to our insurance advisory team in a fully compliant manner. That’s a model to repeat in EU countries. Michael Moran: What about competition? Insurtech today is a very competitive field. Who do you see as your fiercest competitors and in which markets do they play? Bojer: As you said, the market is huge and somewhat crowded. We are specifically looking very closely at the German-speaking markets in Europe, such as Germany, Austria, and Switzerland, as well as countries like France and Italy, which are very close to us. I think there are lots of things going on in the space. There are large global partnerships between banks and insurance companies, for instance (Dutch bank) ING Group with (French insurer) AXA or (the Swiss insurer) Zurich Financial [with Chinese commercial lender Bank of China]. On the other hand, these are not technology-driven. We see lots of innovation also coming from from the insurtech industry, especially in Germany. But we currently are almost alone in Switzerland, and the traction has been especially good over the last 12 to 18 months. Michael Moran: In terms of the business model, the most common way to move forward as an insurtech startup seems to be to seek a partnership with a big insurance or banking partner or both. Or is there ultimately an ambition in some places for a kind of pure play model, where the insurance would actually originate from the insurer technology? Bojer: Yes. We also see lots of movement in this area. In Germany, for instance, we see lots of insurtech insurance and we see lots of insurtechs acting as “push-tech” insurers. Two examples are Covéa in the U.K. and Element in Germany. So I think this is very interesting. For us, we’re more interested in the so-called MGA model — the Managing General Agent model — whereby an individual or business entity appointed by an insurer solicits applications or negotiates insurance contracts on behalf of an insurer. This is pretty well known in the U.S. as well as in the U.K., but not so much here in continental Europe. So that is where we see more opportunities. Michael Moran: The insurance and health insurance industry has had a pretty successful and stable model for over a century, while technology, as it does in many industries, is seen as both a potential disruptor of and an accelerant for these. So where do you see the big insurers right now with regard to insurance tech? Bojer: Yes, indeed I think technology definitely is an enabler these days. What we see on the legacy insurance side in terms of technology is large insurance companies, or reinsurance companies partnering up with insurance technology startups in specific fields. Nevertheless the core problem still exists on the legacy side, which is that core insurance systems at traditional industry leaders are not set up to integrate technology. So insurtech cannot take a monolithic approach. I think this is definitely a space where Anivo provides tremendous value to insurers and reinsurers. We can use our platform to put the product together by automating much of the underwriting without changing the partner’s core insurance assumptions. This also allows traditional insurance or reinsurance companies to concentrate on distributing and operating innovative insurance products without worrying about the IT that drives their core insurance system.